My motorcycle insurance renewal premium arrived on my door step today! Those who have followed some of my previous Prudent-Pete money saving posts will undoubtedly know by now that I don’t just accept insurance renewal premiums without question. Maybe you do or you just can’t be bothered to spend ten minutes or so trying to get a better deal. I can’t afford to, so I always check for a better insurance renewal premium. But remember this, if you don’t you are probably paying more than you need and are just wasting your money. I have saved in the past on every occasion that I’ve applied this money saving tip. I’ve saved on other motoring insurance and you could too with very little work. The savings achieved have been documented (see posts) with similar approaches in the past to saving on car insurance and also saving on house insurance. This time will be no different, I will use my Prudent-Pete method in order to try and save on motor bike insurance. You’ve got to be having a laugh! When opening the Motorcycle insurance renewal letter from my broker, I first noticed that the insurance premium has risen by over 25%. To my horror I also noticed that my excess has also increased from zero to £450! This in another year without any claims. Seeing these increases has made me even more determined to save and get a better deal with my motorbike insurance this time around. As already mentioned the method that I will employ today to save on my motorcycle insurance has been used before with my save on car insurance post. I’m confident that it will again do the job for me today. As well as studying the insurance renewal letter I will also need to do a little research work by first obtaining some online motorcycle insurance quotations. These will then be used to compare and hopefully save. To compare fully you will need to enter similar requirements to that of your current policy. As my insurance company has decided to change my cover and supposedly find me a better deal I will use my current policy cover as a base to compare against and not the renewal. This I view as something they should have kept similar and not change without my approval. OK, so first I checked and obtained a couple of motorcycle insurance quotations from insurance providers that I have used in the past to insure my motorcycle. This has usually worked in the past to get a better deal. However on this occasion the quoted insurance deals came back very similar to that of my renewal. Still not wanting to be beaten and not knowing many motorcycle insurance brokers I decided that I would give an online motorcycle insurance comparison site a go. I’ve said in the past that I’m not a big fan of these sites but today I am determined to get a deal. A quick search on Google returned several of these in the results. 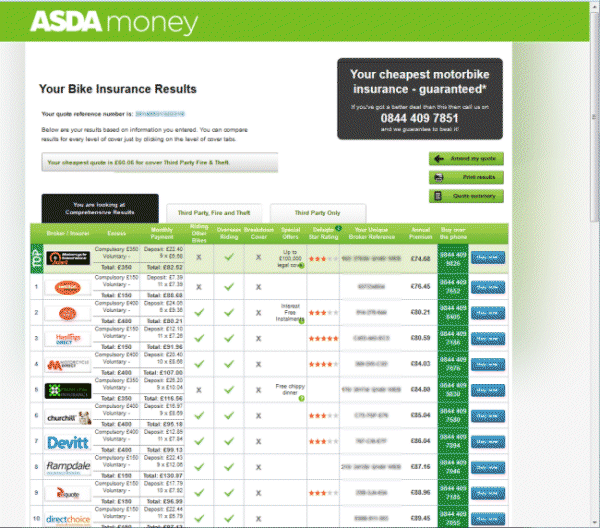 I thought that the Asda money motorbike insurance sounded OK especially with the phrase “Your cheapest motorbike insurance – guaranteed” on their website. After typing in all the requirements for my policy the site gave me some encouraging motorcycle insurance quotations. The one that caught my interest the most was from Swinton. It offered me similar cover with zero voluntary excess with £150 compulsory at a rate that was cheaper than what I paid last year. To my surprise my present insurer was also quoting a premium less than what arrived on my doorstep! As always, once I had found a good quote with the same or very similar motorcycle cover I got in touch with my current insurance provider to give them the opportunity to match or bring down their renewal quotation. If they do, not only do I save money, it will also save a lot of time on paperwork staying with them. Again the short phone call worked for me. My motorcycle insurer went one better and slightly beat the Swinton quote. Try my real-life Prudent-Pete money saving tip yourself and see how much you could save on your motorcycle insurance next time your renewal premium arrives in the letterbox. It may not work forever, but I will continue to spend just a little of my time each year checking! Update – I have just received this year’s renewal. What is it with these Insurance Companies? I really can’t believe it when my yearly motorcycle insurance pops through the door and they have not only put the price up, but also changed things on the policy! My insurance renewal has once again arrived and the broker has put my renewal premium up by over 25% and on top of this they have even increased the compulsory excess from £150 to £400. This unless you check the small print you’d probably not even spot it! Well I have used the method detailed above and again saved on my motorcycle insurance. Had to switch companies this time though as the old one couldn’t match what I found elsewhere using my blog method.